There are 25 regional Passport Agency facilities. All of these facilities require that an advance appointment be made. Some of the regional passport facilities will issue passports same day, some will issue them the following day, and some only offer a two-day turnaround. Appointments are usually available, however we have seen them fill up all available appointments up to a couple of weeks in advance. 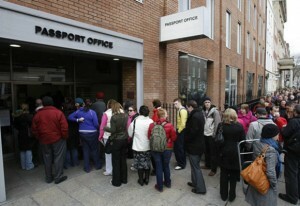 The local passport offices are acceptance agents primarily located in post offices and county courthouses. An acceptance agent at a local post office or courthouse can only witness your signature and seal your documents (Unless you are using a 3rd party passport expediter, the acceptance agent will send your passport application on your behalf to a regional Passport Agency office for processing). These offices DO NOT ISSUE PASSPORTS, you have the option of standard service or expedited service. Assuming that there are no issues with your application and/or supporting documentation, expedited service takes 2-3 weeks and standard service takes 6-8 weeks. Any errors, omissions, issues with your photos, or other such common problems may delay your application.